Preheat oven to 350°F. Slice baguette, arrange slices on sheet tray and brush with olive oil. Bake until lightly toasted, about 10 minutes. While the baguette slices are toasting, reduce the Balsamic vinegar by heating it over medium heat in a non-reactive saucepan, simmering until it has reduced by half. Transfer liquid to a heat-proof liquid measuring cup (measuring approximately 3 ounces). Set aside and allow to cool. 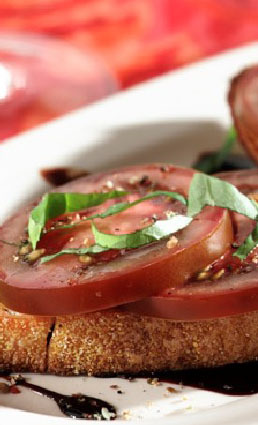 Allow the toasted baguette to cool, and then top each slice with 2 tomato slices. Sprinkle with black pepper and thin strips of fresh basil. Immediately before serving, drizzle with Balsamic vinegar reduction.